albertlaw Today close at $1.17 Is Ms Saw up her bid from $1.16-1.165? alibaba13131 is anybody know who's their automotive customer? Any thoughts on Investing in Malaysia? zenden why this stocks can't go up as much as breadtalk or sheng shiong? tch1006 price breakout with high volume but halted, any good news? GoRiLaz7028 Referring to this case, at least be with cash and aim for debt free. ashokarugi where can get form and is it on line? gundam deathscythe Didn't notice it raise back. Good to see more good news. kongim61 This is my comments on F&N Malaysia. siva123 Spot on. Unlike the regional analysts. Is it time to buy into ST Engg? lotsofmoney The target is Russia and IS. Target price USD 50 per barrel. 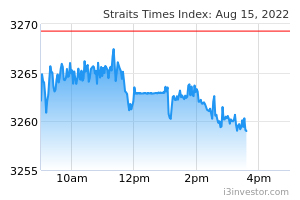 Stock: [Indofood Agri]: INDOFOOD AGRI RESOURCES LTD.
Jian Bin Siew Anyone buiying this counter? Stock: [Memstar Tech]: MEMSTAR TECHNOLOGY LTD.
Lee Christine is it time to buy now? any advices? Stock: [BMM^]: BM MOBILITY LTD.
Pretarious Seems not. On a active bull run now.